Pula lies at the tip of the Istrian peninsula, immersed in the eternal southwest sunshine. Pula is a very ancient Mediterranean city with rich and long culture, where every monument and stone remind you of the era before Christ. Were he a person, he would surely be civilised, wistful, curious and mysterious. The capital city and the center of the southern coast of the peninsula has the indented coastline adorned with picturesque National park Brijuni islands, a wonderful warm sea, bays and beaches, reefs and islets. Beaches are covered with gravel and stone pebbles, made of concrete and rocks They are surrounded by the blue sea on the southern side and on the north with thick ancient pine trees. Underwater is rich in flora and fauna, sunken ships, amophora and ancient stone ruins. The hinterland enchants with red fields, greenish mountains and meadows. Located in well shielded natural port in Istria, the town lived from the sea and maritime affairs. 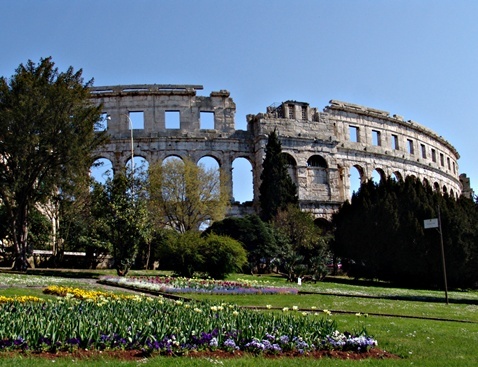 During the Austro-Hungarian Empire, Pula was a major military port. Once it was the residence of rich families, rulers and those in power who enjoyed the treasures of primeval Mediterranean, who built their summer homes, villas, thermal pools, baths, parks, gardens, forums... The tradition of fishing, shipbuilding and maritime affairs has held until today, as well as the olive growing and wine making, which date from the times of Greeks and Romans. Medadria.com does not own and control the content of these photographs.